My Christmas cactus has bloomed yet again since my last post. Since the flower is just a bit seasonally confused, I think I can post about the holiday long past. 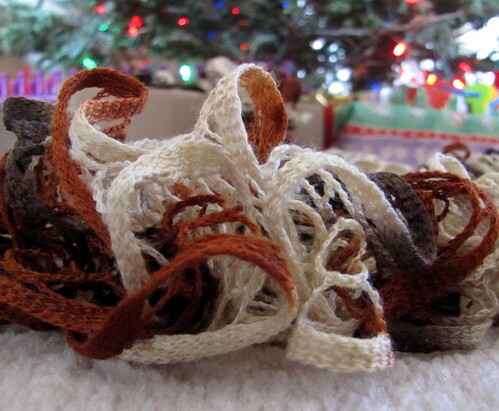 After watching Isela Phelp's video tutorial using ruffle yarn, I had to try this scarf for my mother-in-law. The scarf does knit up fast! When my wrists were hurting from working on a different knit, the looseness of this project was a treat. It is hard to find a nice rhythm though so I'm not sure how many more I will make. I love this pattern by Bethany Dailey. But even after giving them yet another chance, I absolutely loathe, loathe, loathe loom clips. (I find them hard to move and one even broke off into a long loom.) So after finishing one mitten with the clip and discovering the mitten was too small for my forgiving sis — I knit a new pair with no shaping. So the top is a gathered bind-off instead. 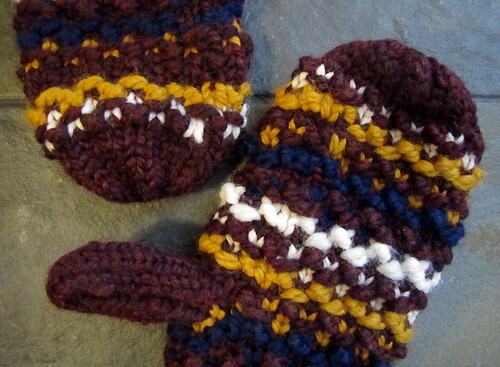 It made for a bulkier mitten great for shoveling all that snow we didn't get in Wisconsin. But both my sister and wrists thanked me. Yes, I did finish a stocking for me in time for St. Nick's. Nope, I do not have a polished pattern yet. I am still tweaking and I plan to perfect the process for CB's sock. My stocking features some diagonal garter stitch (love it! ), holly colorwork (needs a little work) and cable colorwork in the foot (not a good choice). I crafted nearly a dozen of these mini wreaths. I should have taken a photo of the pile. Oh well. I made the cute pendants out of scrabble tiles at a local craft shop, DIY studio & gifts. 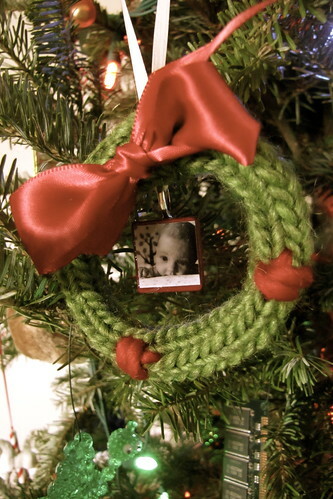 Little CB wreaths went to her grandparents, great-grandparents and aunts. I also made two logo ones for Interlacements Yarns and LucieLu. I'll write up a pattern someday but it's basically an i-cord if you can loom knit that. Since I was just so "bored" back then, I also made some memo boards. First, I tested out the process and made one for CB. Then I made one more to complete my sister's Christmas gift. These boards rock! And are so easy to make, too. I'm going to make a bigger one next year for all our holiday cards. After the giving, I also humbly received. My mom gifted me the KB sock loom that satisfies many of my wishes. Solid, no moving parts. Grooved pins. Meant for DK/light worsted yarns. I can't wait to cast on a sock! ... And the Martha loom waits in the wings as well — maybe for a woven placement project. But many other projects come first that I hope to blog about in the coming months. What's on my loom now? I am adapting a shawl pattern by Renee Van Hoy with a little beadwork. And I can't share it until after my sister's wedding day in June! Great to see you posting again! I love all your projects, especially that gorgeous Christmas stocking. I look forward to the pattern for that one. Also, I know what you mean about the loom clips and I've made a little discovery that helps with some of the aggravation. Michaels is now selling their version of the long looms under the Loops & Threads brand. The KK loom clips not only work on these looms, but they work better than with the original KK long looms. No more cursing when removing the clips! Nice to have your posts, and lovely photos, again. Your colorwork is lovely. Can't wait to see your beaded shawl. What a fantastic stocking! That is truly stunning...LOVE! Your other items came out beautifully as well. I used to teach on class on making memory boards at Michaels. 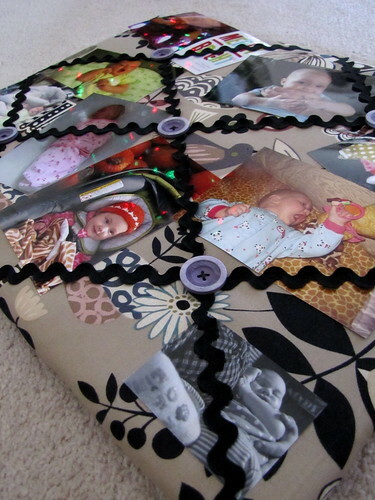 We used batting and fabric covered wood framed art canvases and long decorative brads for the ribbon overlaps...that way, there was no sewing involved and it made a bit of a pucker in the board where the brads cinched into the stuffing...sweet! 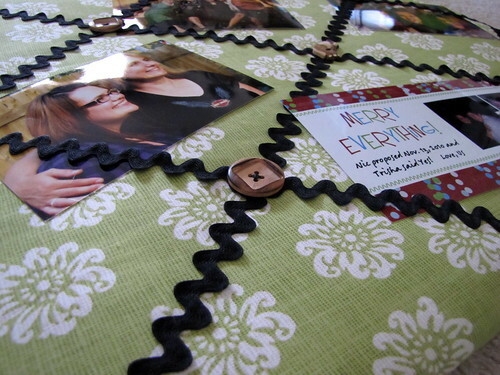 :) Then it was all hot glue and staple guns from there, haha.